Love escape rooms but hate being locked in a room? Love playing outside in a park? Love solving various puzzling challenges? Love playing along with friends/family/colleagues as part of a team? Love having a challenge of completing a mission in 60 minutes? Then you’ll love Agent November. Then Agent Novembers game Major X Ploe-Shun has recently been updated with a newer story but still unlike no other escape type game as set outside in a park in the Euston area. All missions are run live and supervised by one of their secret agents giving you tips and advice if needed. For our game we had Agent Jason who was a pleasure to help crack the mission with. Firstly we are given a brief about the new mission of Major X Plow-Shun. Major X Plow-Shun has gone missing whilst he was investigating Marty Orri and has either been captured or he has defected to the enemy! So it was up to us to help Major X Ploe-Shun solve mysteries and crack open a briefcase that contains a nuclear EMP device. Think outside the box, find keys, passwords and codes which will eventually give you the code to open the case and deactive the device. Agent November also has two other games Murder Mr E (which is set in a pub) and The Rainbow Syndicate (set outside). Highly recommend especially for any sunny day. Thanks to Agent November who let some of us from Love Pop Ups London come down to play the newly re-improved Major X Plow-Shun. Read our blogs/reviews from the comments below. An outside escape game? There’d be no locked room to escape from! What is the point huh? Well there is a point! 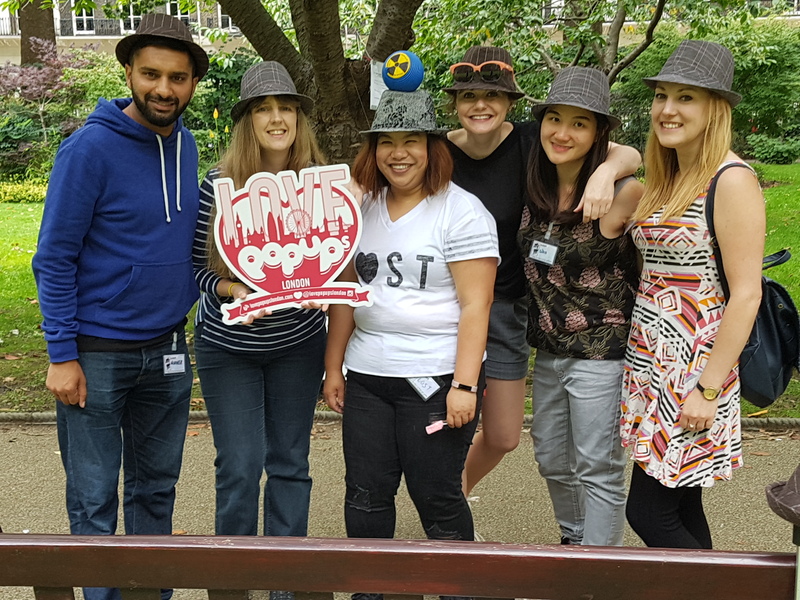 Agent November takes escape games to the next level with this forward thinking game situated in one of London’s smaller but stunning central parks. A group of 6 played the revamped Major X Ploe-Shun on a sunny Saturday and had the best time. We met our secret agent in the park where we were debriefed on the mission – to uncover an accomplice and deactivate the nuclear EMP device – AND BEST OF ALL we were each given a walkie talkie and a secret agents hat (looking the part!). We were then let loose in the park to uncover clues and codes. There was certainly plenty for everyone to do with some brilliant puzzles and an awesome finale. Agent November runs 3 different games suitable for 3-7 people (2 outside and 1 inside). On request, they can run multiple games simultaneously perfect for big team building outings. All 3 games run rain or shine so make sure you wear something suitable. I was also worried about trekking around London however never fear as it is all located within the park so no long walks! A huge thank you to Love Pop Ups London & Agent November for letting me experience it! What is better than solving an escape room inside? Possibly the only thing is solving one outside in the summer sun. Another great escape game from Agent November, I love the fact this based outdoors, you can enjoy the London summer sunshine as well as solving clues with a group of friends..
It’s been a while since I have done an escape room and thanks to London Pop Ups I was able to fulfill that. This escape room remarkably wasn’t in a room…in was in a park! A lovely park centrally located too! I found that quite refreshing and it helped that it was a sunny day out and not too packed. We had to disarm a bomb that was under a timer of one hour till detonation. I thought the agent who had tasked us with our mission really helped give us a purpose with his acting and humour too. There were a variety of different physical and mental tasks for us to compete in the park and we found some easier than others but what’s a mission without a challenge. Some are more simple than you realise! I liked that we all worked as a team as the task went on and it was made so much more fun with the other ‘agents’ in our group. We finished the mission with 15 mins to spare. Great job team! All in all I had a great time and wouldn’t hesitate to do this again. Think escape rooms as a concept is so much fun. Love pop ups also provided us with some Free Fentimans drinks that was great to enjoy after the hour was competed. Perfect. Agent November revised Major X Ploe-Shun game still showcases Major X Ploe-Shun’s complex device that you have to unlock in order to prevent the destruction of key evidence against a crime gang. If you have played the original game, you’ll know that the game is outdoors and that you’ll be briefed and supervised by an agent at all times. This leaves you to focus on the task at hand, solving new riddles, puzzles and finding for clues around Tavistock square. This game is great to play when you want some time outdoors. Our team managed to escape with 12 minutes to spare because we had great team work and was familiar with an outdoors based-game. It’s quite interesting and different to traditional locked in a room escape games because the agent will be with you at all times. This is beneficial if a lock fails to turn, or if a key opens a wrong box, as help is on hand and you are reassured if things are working the way that they should. I would definitely recommend this game. Thanks to Love Pop Ups London for organising the experience!